This Liverpool-based group had its origins in the Mersey boom. Lead singer Eddy Amoo was a former member of the Chants, whose excellent beat singles garnered considerable praise. Although they failed to chart, the Chants continued to record for various labels until the name was ultimately dropped. 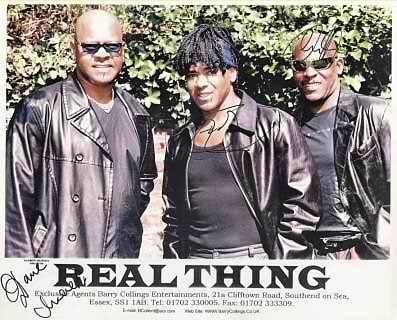 The Real Thing emerged in 1976 with "You To Me Are Everything", which reached number 1 in the UK. Their next release, "Can't Get By Without You" continued their brand of commercial sweet-soul, but later singles were less successful until a more forthright performance in 1979 with the Star Wars-influenced "Can You Feel The Force", took the group back into the Top 5, establishing their popularity with the UK disco audience. Dave: Yes of course I remember the California, it's gone, what's there now? There was then a general discussion on Edwin Starr's comments in an interview with Paddy Grady, that if he was to choose the one place he wanted to play then it had to be the California Ballroom. Dave and Eddy agreed. Me: It wasn't until I started doing this site that I realised it was so famous. Eddy: Yes, everyone knew it, all the big American artists wanted to play there. It's a shame it's gone. I have to say that when going to see some of the bands I used to rave about back in the seventies, it can be something of a disappointment. Let's face it, we're all a lot older than we were and the entertainers have grown older with us. I would therefore like to know whether Real Thing have been drinking from the same fountain as Sir Cliff, as these guys seem completely unaltered. I've seen them live twice in the last year and on both occasions I have been more than impressed. There are only three of them now but those three are originals; Dave Smith, Chris Amoo and Eddy Amoo, and boy can they deliver! I was delighted to note that they resist the temptation of many bands to blast the room out and the sound system is set up so that you can actually hear what they're singing. Their backing band do them proud and are stars in their own right. What really made me sit up though was their appearance at Edwin Starr's Tribute concert. Here the guys did their entire set acapella and it was outstanding! I doubt there are many live acts who can have a crowd on their feet dancing when there's no music. If you get the chance to see Real Thing live, grab it!